Blog from Port Macquarie, New South Wales | Hello World! We spent two nights in Newcastle. Not much to say about Newcastle apart from it was gloriously warm and there was a rather nice beach there. That's pretty much all we saw, as we took an earlier bus to what we originally planned in order to reach Port Macquarie at a reasonable hour. Our original bus wasn't due to arrive until 1:45am which we weren't so keen on. We had two nights at Port Macquarie staying at Ozzie Pozzie backpackers, possibly one of my favourite hostels so far. One of the best parts about it was the hostels parrot called Cheeky, he said hello to me and we became good friends. There are 9 beaches in Port Macquarie but we only explored 2 of them. On the day we arrived we walked along Town Beach, and all the boulders along the walkway have been decorated which looked pretty snazzy. 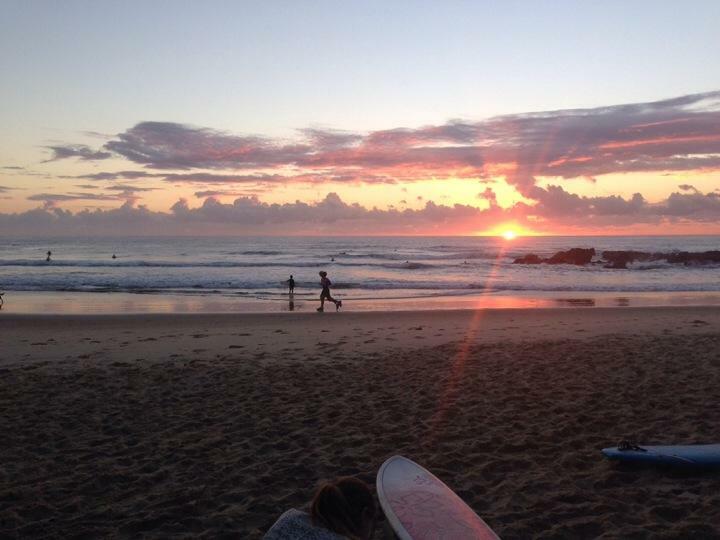 When we got back to the hostel I decided to sign up for the 'sunrise surf'. It only cost $25 and that included wetsuit and board and also a beginners lesson so I jumped at the chance, absolute bargain! The only downside was the 5:30am start the next day. However when we got down to the beach we realised it was most definitely worth missing out on a couple of hours sleep. The sun was just peering over the horizon looking absolutely stunning. I thought the sea was going to be colder than it was but it was lovely and warm. The first 15 minutes mainly consisted of a lot of giggling but after a while you get used to where your weight has to be balanced on the board, and eventually I managed to stand up (admittedly quite wobbly) 3 or 4 times! Thankfully we didn't encounter any sharks. That afternoon a group of us from the hostel made our way to a koala hospital, which look after and aim to release injured koalas back into the wild, and they do free guided tours everyday at 3pm! We met Barry who is an elderly bear who has a misshaped spine and saw him being fed with a syringe, along with many other koalas with injuries such as burns from bush fires, or being hit by cars. Very cute. After an early morning swim in the pool we are now headed towards Coffs Harbour.